The Qualys SSL Labs free online server test performs a deep analysis of the configuration of any SSL web server on the public internet. First, the certificate is checked to verify that it is valid and trusted. Second, the server configuration is inspected within three categories: protocol support, key exchange support, and cipher support. Finally, the separate category scores are combined into an overall letter grade of A, B, C, D, E or F. Learn more about the SSL Server Rating Guide. Serv-U Managed File Transfer server (MFT) is an FTP server software that supports a range of security protocols including FTP, FTPS (FTP over SSL/TLS), SFTP (FTP over SSH2), HTTP, HTTPS (HTTP over SSL), IPv4, and IPv6 networks. Serv-U also supports FIPS140-2 validated cryptography. 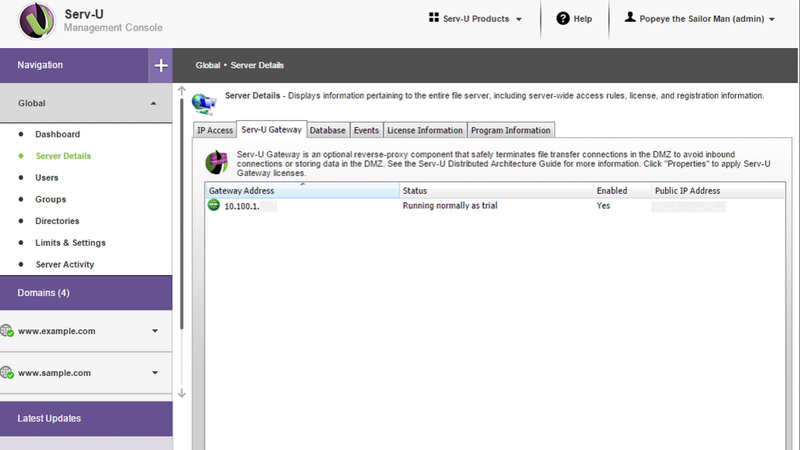 Optional Serv-U Gateway add-on provides defense-in-depth security to Serv-U MFT Server deployment. It helps ensure no data is stored in the DMZ to comply with PCI DSS and other regulatory frameworks.